SEO & Black Friday: How are brands preparing their landing pages? We’ve been looking at some analysis of search performance in the lead up to Black Friday. Electrical retailer Currys has had its strategy licked for some time, whereas Amazon has the odd improvement it could make to its usually omnipresent site. Both sites show a consistent (and year-round) landing page is important for brands capitalising on annual events. Firstly, it’s worth noting the scale of the opportunity on Black Friday. Last year, Amazon sold 5.5m items, a record. And across the UK, Google trends shows how established the day became last year, with searches increasing dramatically. In fact, websites such as Tesco and Currys themselves were brought down by the scale of internet traffic they received. Currys has shown good search performance in the lead up to Black Friday 2015. If we look at the chart below (created with Pi Datametrics) showing Google UK search positions for the phrase ‘Black Friday 2015’ over time, it’s clear that Currys has had one page ranking consistently all year. This page peaked recently at number one and has been live continuously since Black Friday 2014. No other Currys URL has appeared above this page since November 2014, showing this is a consistent landing page. What’s even more impressive is that this Currys page is the only British retailer ranking for a host of Black Friday search terms. There’s a proliferation of American results on the first page of Google UK this year, giving greater competition for these key phrases (see snapshot below of US sites ranking in search). Yep, that’s right, Currys has had a dedicated Black Friday landing page up all year round. The retailer has changed the page title tag to display the relevant year. It now reads ‘Black Friday 2015 – Black Friday Deals | Currys’. And, of course, the page content has been adapted so it’s relevant when out of season. There’s a countdown and invitation to ‘put the date in your diary’, as well as plenty of information about the online shopping experience (beat the crowds) with links to buying guides, price promise, Reevoo scores, payment and collection methods, delivery and installation – all intended to reassure the customer that Currys is a good place to bag a deal on Black Friday. To increase the out-of-season usefulness of the page, there’s also a link to ongoing sales (the autumn sale, in this case) and plenty of information about buying a laptop bundle from Currys (including a link to ‘view our range’). As one would expect, Amazon ranks well for all sorts of Black Friday search phrases. However, something funny is happening when we look at ranking for the phrase ‘Black Friday 2015’ once again. The chart below shows two pages that have both, at some point over the last six months, been the top returning Amazon URL for ‘Black Friday 2015’. The pink page initially ranked highest and still occasionally deposes the yellow page, with neither having ranked on page one of Google for this phrase since April 2015. What is causing the poor search performance for this phrase? The ‘pink’ page is interesting, it turns out to be a product page for an app download. The app is some sort of Black Friday quiz/info finder for Black Friday deals 2015 and isn’t an Amazon info page at all (see screenshot below, and click-through). The URL of this page begins ‘/black-friday-shopping-2015’ and probably explains why it has in some places been ranking higher than Amazon’s Black Friday info/deals page (in yellow) for the phrase ‘Black Friday 2015’. As you can see from the chart above, the two pages have switched places since August (and once in April) as Google ‘struggles’ to decide which of the two is most relevant. How can Amazon fix this? Well, it’s unfortunate that this product page (the Black Friday app) has the title and URL it has – if possible this needs to be changed. Perhaps Amazon’s actual Black Friday Deals page could be improved with the addition of ‘2015’ to the title tag, too. It’s ranking well for other phrases at the moment, but its content isn’t as useful as that on Currys’ corresponding page. Take a look below. There’s no information on how customers can prepare for Black Friday, just a rather amateurish sentence at the top (‘Black Friday 2014 is now over..’). Yes, there are plenty of links to other deals, including featured products but surely Amazon could make this page more relevant? Scrolling down the page, one does find a bunch of text giving some background to Black Friday and mentioning some products likely to be discounted. However, given the importance of Black Friday to retailers, Amazon could stand to emulate the Currys page, with more information to prepare the user ahead of the big day. It’s important to note that this is just an issue with one search term, Amazon is performing well on other phrases, but it still represents an opportunity. Get your ducks in a row early. Check which of your pages is ranking, year round, for various phrases relevant to high-traffic annual events, especially if you’re competing for keyphrases that originate in the US. 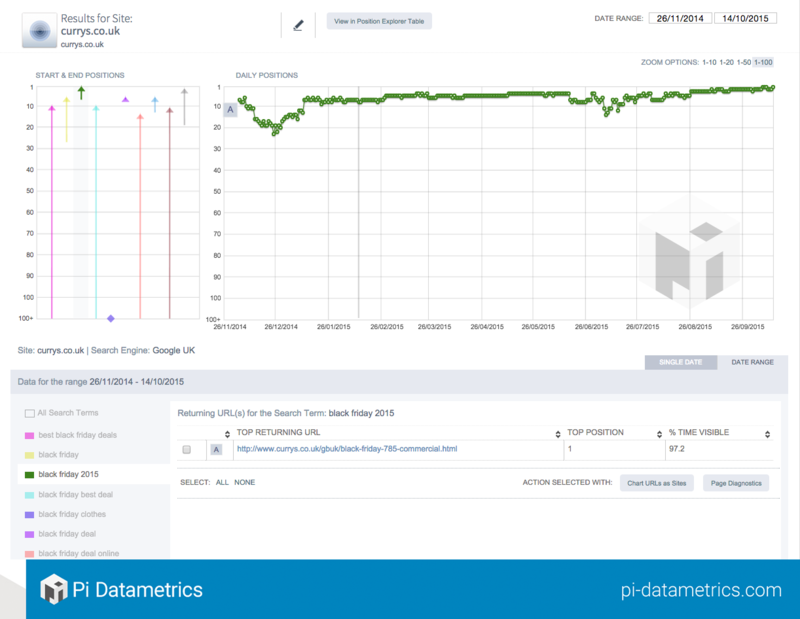 Amazon is ranking well, so might not be worried by its blip in the SERPs for the phrase ‘Black Friday 2015’, but it still shows how search performance can be affected if you don’t keep an eye open. The lesson for companies to take from Currys is to make your event landing pages ASAP, do not take them down after the event, and adapt them as the year goes by with more good content. There’s really no reason to take these pages down. Sam Silverwood-Cope, co-owner of Pi Datametrics, told me he is still suprised at the amount of pages for annual events that are created time and again each year, citing The Grand National as an example in sports betting. So, which annual events does your company capitalise on and have you got your corresponding pages ready? Recruiters should start thinking more like search marketers in order to get more traffic to (and quality leads from) their job listings.